The Electro-Voice ND96 is a robust, high-performance dynamic supercardioid vocal microphone. 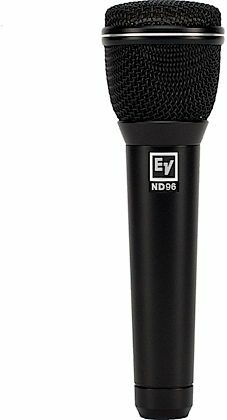 Designed for excellent acoustic control on very loud stages, the ND96 special structural and acoustical designs create performance characteristics allowing the microphone's gain before feedback in a mix to be significantly louder than most microphones. The ND96 dynamic capsule contains a large Mylar diaphragm which delivers a rich and detailed frequency response by combining its large surface area for tonal balance with its low-mass high-velocity material for exceptionally fast transient response. The ND96 features a selectable vocal tuning that can be engaged to reduce certain low-mid frequency areas and emphasize key upper-midrange vocal presence areas to increase intelligibility in high energy reinforcement. The ND96 features an innovative capsule shock-mount system consisting of a 4-point suspension around the circumference of the capsule combined with a tuned pneumatic pump at the capsule base, offering superior handling noise reduction to eliminate mechanical vibrations and noise in the mix. The ND96 capsule uses a humbucking coil that attenuates AC hum and electromagnetic interference. ND dynamic mics can be used with confidence near speaker cabinets and EMF generating equipment racks. The ND96 Memraflex grille is made of a durable tightmesh grille wire that withstands extraordinarily-rough treatment. Your microphone remains protected and looking good gig-after-gig, year-after-year. Overall: I have been a singer for over 15 years done it professionally and now I lead for my church. A few of us did a test between multiple mics including the Blue Encore 200, Shure SM 58, Shure KSM8, Audix OM2 and 7, and the EV ND96 is by far superior and for the price you will never need another mic. Just incredible sound, clarity, and drive. Just beautiful. 9 of 9 people (100%) found this review helpful. Did you? Overall: Ive sang through Blue Encore 200, Audix OM2 and 7, Ive sang through betas and many many other mics. The presence of this mic and the feedback to gain is amazing. The Clarity is beautiful. I cant say enough about it. 7 of 8 people (87.5%) found this review helpful. Did you?